I have never been to a class before. Where do I start? Don’t worry, you are in safe hands – thousands of people have taken their first ever yoga class with triyoga. A beginner’s course is a great option if you are a complete beginner, as it gives you a sturdy foundation in which to explore any Level 1 or Open Level class with confidence. But if a course doesn’t suit you, any Level 1 Class will be suitable for you. View all Level 1 Classes for the next 7 days here. What is the minimum age for attending a class or treatment at triyoga? Triyoga offer yoga classes specifically for toddlers, children and teens. View these classes here. The minimum age for attending all other classes or treatments alone is 16. The minimum age for attending a hot yoga class is 16. Children aged 14 or 15 may attend all other classes with a guardian who is over 16 at the class teacher’s discretion. If you would like to bring your 14 or 15 year old child to a class please contact the triyoga centre that you plan to attend to confirm that the class is suitable. How do I choose the best yoga class? Talk to our front of house team either by giving us a call, or pay us a visit! You can also read more online about choosing the best class here. Can I go to a class if I am pregnant? Yoga and Pilates are excellent during pregnancy and for you and baby after the birth. However it is recommended that you do not practice yoga or Pilates in your first trimester. You can return to practice in your second and third trimesters, where yoga and Pilates are both fantastic supports. Find out more about our pre and postnatal classes and treatments. I am not flexible – can I do yoga? Yes. If you’re inflexible you’re a perfect candidate for yoga. Yoga enhances flexibility; it’s not a prerequisite. So if like many of us, you’ve got tight shoulders, hamstrings, hips, quads…yoga will really help. Is anyone too old for yoga? The wonderful thing about yoga, is that you can never be ‘too old’ to start or practice. Yoga and Pilates are practices for life, and they can be modified to suit all ages, and levels of strength and fitness. At triyoga we offer classes for all ages, from babies and kids through to adults. 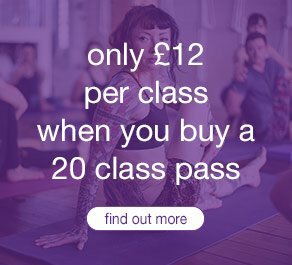 If you’re new to yoga the best way to start is with a beginner’s course or with a level 1 class. For an even gentler experience you may want to try Yoga Gently or Restorative Yoga. Some people wear baggy, loose fitting bottoms and a t-shirt. Other people wear tight stretchy leggings and tops. The only thing that matters is that you wear comfortable clothes that you can easily move and stretch in. As you move through a class you can get warm so it’s good to wear clothes that keep you cool, but bring a jumper for relaxation, when the body rapidly cools down. Some people also bring socks for the relaxation phase. In triyoga hot, dynamic and ashtanga classes you will get sweaty and some people like to bring a small towel to class. We provide mats and all other equipment you may need at all our centres. We also regularly clean our mats and equipment. If you would like to purchase your own mat we sell a varied selection in our shops at each centre. When should I arrive for my class and what if I am running late? If you are a new to triyoga and have not already registered for an account, please arrive 20 minutes early for your first session to allow time for registration. We ask that if you have booked classes online, you arrive or sign-in a minimum of 5 minutes prior to the class start time. We understand life happens and sometimes lateness cannot be avoided. In these occasional situations we will always try to find you a place in your class however please be aware that some popular classes have a waitlist, therefore if the class is fully booked and you do not sign-in 5 minutes before the start of your class you will not be able to take part in the class. If you are dropping in to a class we recommend that you arrive at least 10 minutes before the class as drop in places are made available from 20 minutes prior to the start of the class. We do not allow any late comers into triyoga hot classes or due to the importance of the warm-up postures or tre® classes. Is there an etiquette guide? Yes, there is a triyoga studio etiquette guide. This is on display in all our centres and you can read the full triyoga etiquette guide here. What are the pricing options at triyoga? From drop-ins and class passes, to unlimited options, there are a number of pricing options at triyoga. Find all you need to know about our prices here.